From Center for Biomedical Research (E.P.P., G.V.D.F. ), Faculty of Biological Sciences and Faculty of Medicine, Universidad Andres Bello, Santiago, Chile; Stanley Center for Psychiatric Genetics (E.S., D.L. ), Broad Institute of MIT and Harvard, Cambridge, MA; the Analytic and Translational Genetics Unit (E.S., D.L. ), Department of Medicine, Massachusetts General Hospital and Harvard Medical School, Boston, MA; Molecular Immunology Unit (M.R. ), Institut Jules Bordet, Université Libre de Bruxelles, Brussels, Belgium; Cologne Center for Genomics (P.N., D.L. ), University of Cologne, Germany; Service de Génétique Médicale (B.I. ), CHU Hôtel Dieu, France; and Department of Neuropediatrics (B.A.N. ), University Medical Clinic Giessen, Germany. (A) Clinical anteroposterior facial photograph of patient 10 depicting characteristic facial features. 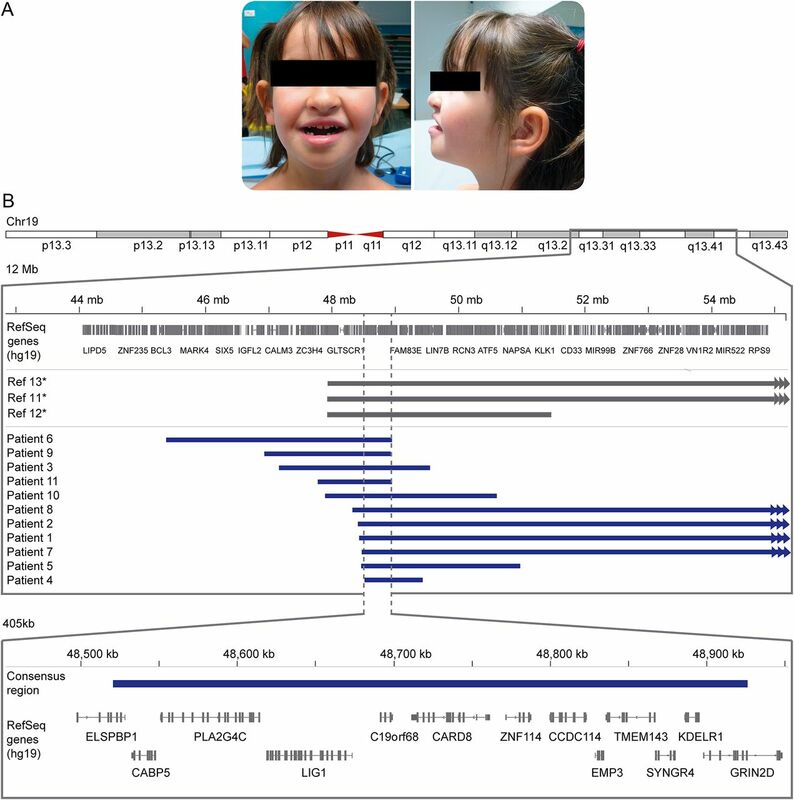 (B) Thirteen patients were identified with GRIN2D duplications at the 19q13.33 locus. Blue horizontal bars represent the respective microduplication size and breakpoints according to GRCh37/hg19 human genome reference in a 12-Mb genomic window. Gray horizontal bars represent the respective microduplication reported in the study by Dorn et al.13 Carvalheira et al.11 and Wang et al.12 in which no exact copy number variant boundaries are specified (*). Microduplications larger than the depicted genomic interval are shown with arrows at boundaries (patients 1, 2, 7, and 8). Bottom panel: The consensus duplicated region of the 12 patients is depicted in the blue horizontal bar in a 405-kb window. Thirteen RefSeq genes are located in this region.